At the end of the First World War, John Singer Sargent (1856–1925) had commitments on both sides of the Atlantic. He had been working on murals in the Boston and Cambridge areas of Massachusetts, but was also expected to deliver his monumental work about the war, Gassed, in Britain. Sargent was now in his sixties, and becoming increasingly concerned about his legacy to the future of art. In 1921, the Museum of Fine Arts in Boston commissioned Sargent to paint a large work for installation on the ceiling of its Huntington Avenue stairway. It was one of the last paintings that he completed before he died back in England in 1925. Every painting by Sargent is special, but this is even more interesting, as it shows a quite unusual story in post-classical art, that of Orestes Pursued by the Furies (1922-25). If you appreciate Sargent’s work, this is worth seeking out in Boston, as the museum also has his preparatory drawings. Aeschylus’s Oresteia is a trilogy of plays which trace the run of murders and tragedy in the lives of Agamemnon, the King of Argos and commander of the Greek forces which destroyed Troy, and his son, Orestes. These start before the first play, when the ‘fleet of a thousand ships’ is about to set sail for Troy. To ensure fair winds and weather, Agamemnon sacrificed his daughter, Iphigenia. The first play, Agamemnon, tells of the return of the king to his wife, Clytemnestra, and her long-standing lover Aegisthus. They have been plotting to murder Agamemnon to avenge Iphigenia’s death, and secure the throne for Clytemnestra, which they do, also killing Cassandra his concubine. Orestes, son of Agamemnon and Clytemnestra, returns home in the second play, The Libation Bearers, to avenge his father’s death some years later. Orestes then concludes that play by murdering his own mother and her lover Aegisthus. The third play, The Eumenides (one of the euphemistic names for the Furies), opens with the Furies hunting Orestes down, haunting and tormenting him to drive him mad, because of these murders. In classical times, Aeschylus’ plays were very popular – they won first prize at the Dionysia festival in 458 BCE – and they and their derivative dramas and texts remain so. Among the more notable derivatives are Eugene O’Neill’s Mourning Becomes Electra, and Sartre’s The Flies. Various scenes from the story were also quite frequently illustrated on pottery of the time. Unknown Artist, Meeting of Electra and Orestes at the Tomb of Agamemnon (340-330 BCE), Paestan red-figure bell-krater, Museo Arqueológico Nacional de España, Madrid. Image by Marie-Lan Nguyen, via Wikimedia Commons. For example, this depiction of the Meeting of Electra and Orestes at the Tomb of Agamemnon from 340-330 BCE shows Orestes meeting his sister Electra at their father’s tomb, variations of which have been shown in much more recent paintings too. Black Fury Painter, Orestes in the Sanctuary of Delphi (date not known), Crater, Museo Archeologico Nazionale di Napoli, Naples, Italy. Drawing (1859) by Karl Bötticher (1806–89), via Wikimedia Commons. 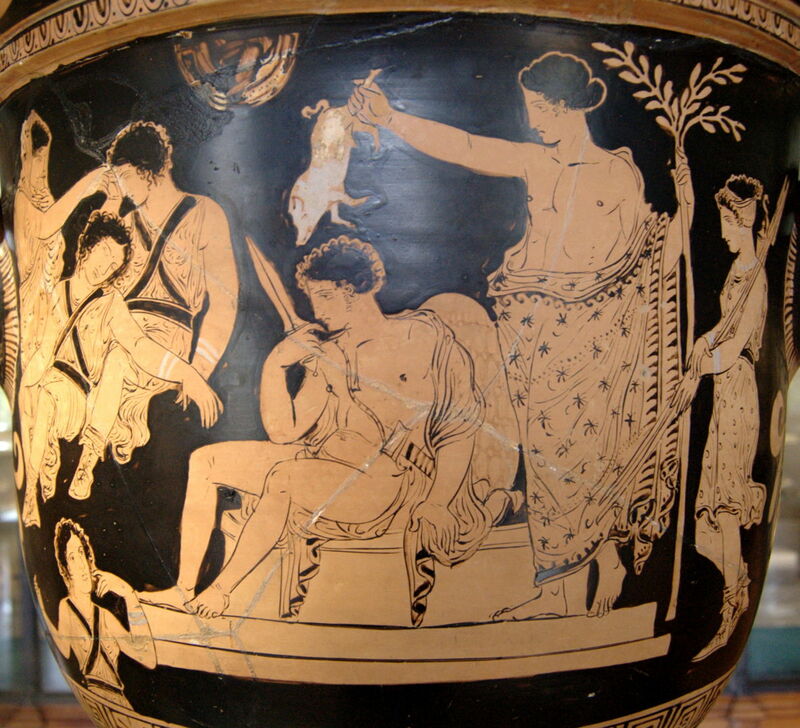 Some of these also feature the Furies, as here in this drawing of an undated krater in Naples. Orestes has been driven to seek sanctuary at Delphi, and in the top left is a black Fury pointing a snake towards the figures. 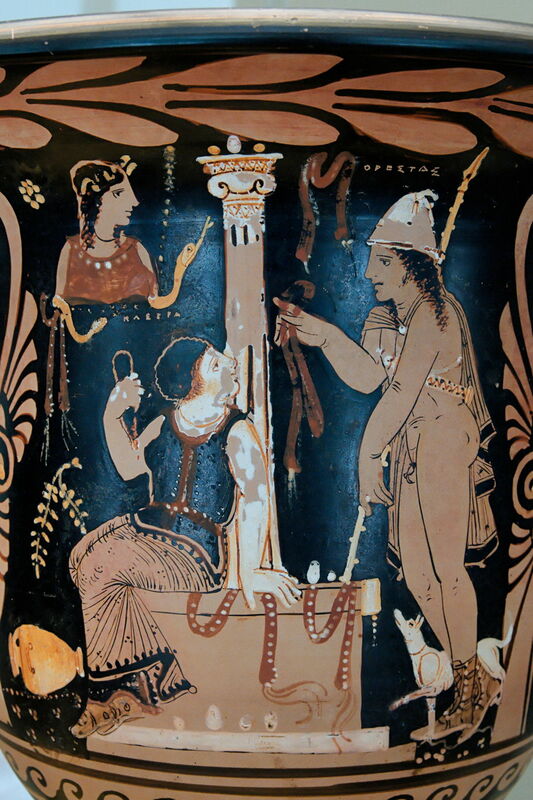 Eumenides Painter (fl 380-370 BCE), Orestes being Purified by Apollo (380-370 BCE), Side A from an Apulian red-figure bell-krater, height 48.7 cm, Musée du Louvre, Paris. Image by Bibi Saint-Pol, via Wikimedia Commons. This Apulian red-figure bell-krater (380-370 BCE) shows a scene taken directly from Aeschylus: Orestes, in the centre and still clutching a murderous sword, is being purified by Apollo. Clytemnestra is trying to awaken the sleeping Furies, shown at the far left. The Oresteia were not a popular source of stories during the Renaissance, and the earliest post-classical work of art that I have been able to locate which shows Orestes and the Furies is from the end of the eighteenth century – two millenia after those painted pots. Louis Lafitte (1770–1829), Orestes Pursued by the Furies (1790), black and white chalk with touches of white gouache on tan paper, dimensions not known, Ackland Art Museum, Chapel Hill, NC. Courtesy of Ackland Art Museum. 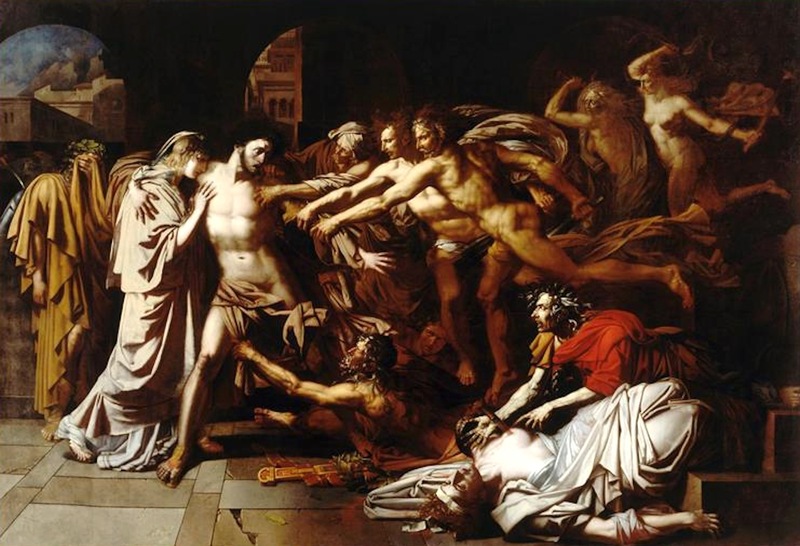 Louis Lafitte’s beautiful finished drawing of Orestes Pursued by the Furies (1790) was exhibited at the Salon in 1791. 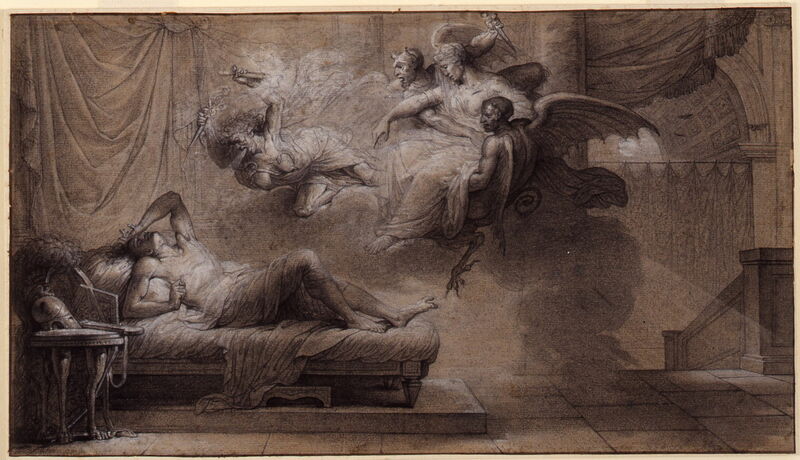 Orestes is seen trying to sleep on a couch, when four Furies visit him. Immediately above him is a Fury armed with a dagger, and to the right two other winged daemonic Furies are carrying the spirit of Clytemnestra, whom he murdered. Lafitte has worked fine detail with his chalks to produce a drawing which is evocative of some of the best work of Henry Fuseli, who might so easily have drawn or painted a similar scene. Philippe-Auguste Hennequin (1762–1833), The Remorse of Orestes (1800), oil on canvas, 356 x 515 cm, Musée du Louvre, Paris. Wikimedia Commons. Philippe-Auguste Hennequin’s The Remorse of Orestes (1800) is very complex, and uses the Furies as a tool for showing multiplex narrative. Orestes is at the left, the centre of attention, and his right arm is holding a woman, who I suspect is his sister Electra. He is under attack by a small army of Furies and spirits, including the murdered body of Clytemnestra, on the floor, and I think Agamemnon too. There is a profusion of arms – reaching out, grasping, tugging. 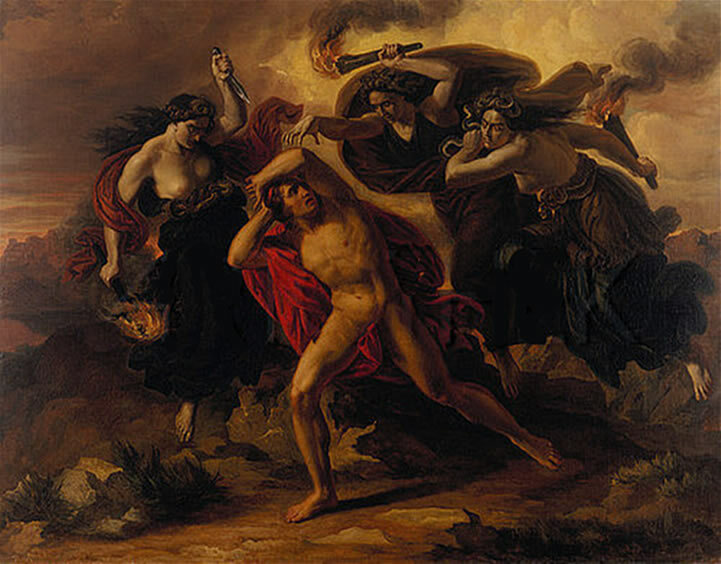 Carl Rahl (1812–1865), Orestes Pursued by the Furies (c 1852), oil on canvas, 154 x 202 cm, Niedersächsisches Landesmuseum für Kunst und Kulturgeschichte, Oldenburg, Germany. Wikimedia Commons. By the middle of the nineteenth century, this scene from the Oresteia was becoming more popular with painters. Carl Rahl’s Orestes Pursued by the Furies of about 1852 is more faithful to the original play, and the classical pottery, in showing three clearly fearsome if not murderous women attacking Orestes with their burning brands and daggers. The hair of the Furies is seen to contain small snakes, following one of the classical descriptions which makes them visibly similar to Medusa the Gorgon. William-Adolphe Bouguereau (1825–1905), Orestes Pursued by the Furies (The Remorse of Orestes) (1862), oil on canvas, 227 × 278 cm, Chrysler Museum of Art, Norfolk, VA. Wikimedia Commons. The first well-known painting of this scene was William-Adolphe Bouguereau’s Orestes Pursued by the Furies (also known as The Remorse of Orestes) from 1862. Three Gorgonic Furies are wailing and screaming at Orestes, and carry the murdered corpse of Clytemnestra, with Orestes’ dagger still buried deep into its chest. 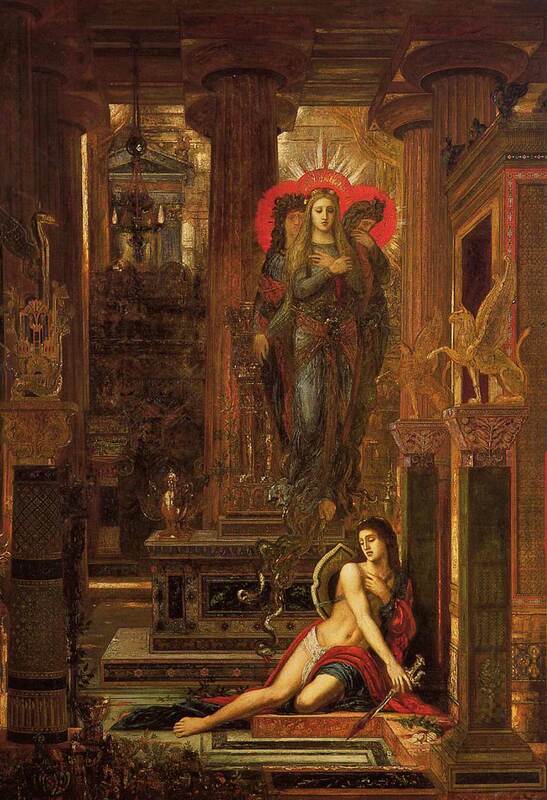 Gustave Moreau’s Orestes and the Erinyes of about 1891 was painted late in his career, and is reminiscent of his earlier paintings of Salome in about 1876. Orestes is shown, still clutching his bloody sword from the murder of Clytemnestra, leaning in the foreground of an ornate temple. Above him are three saintly figures: not the fearsome Furies more usually shown, but the dead themselves, haunting him. 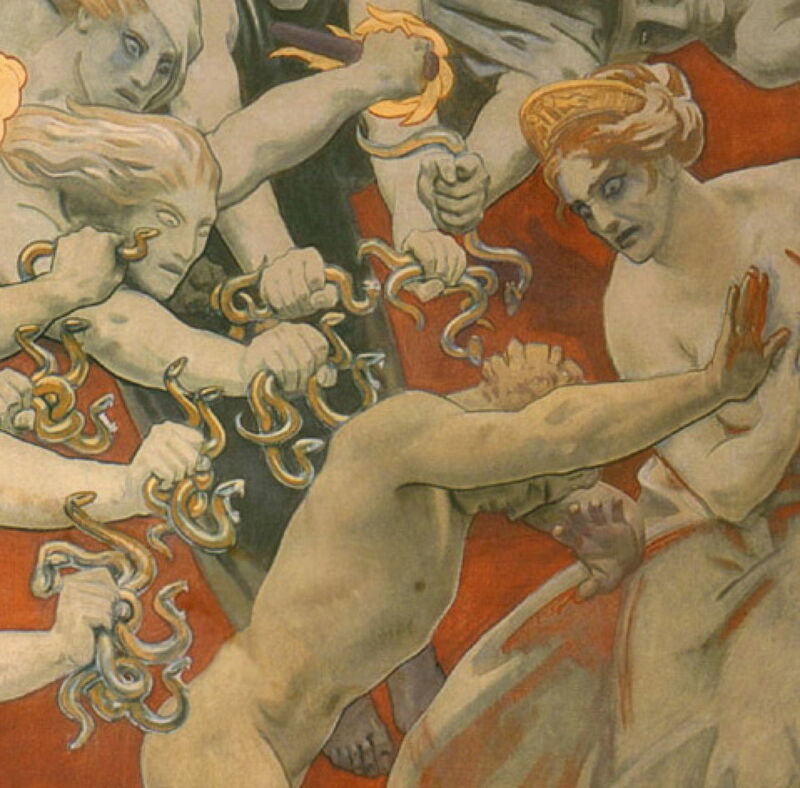 There are still snakes uncoiling themselves from the feet of the Furies, though. Franz von Stuck (1863–1928), Orestes and the Erinyes (1905), oil on canvas, 229 × 207 cm, Galleria Nazionale d’Arte Moderna, Rome. Wikimedia Commons. 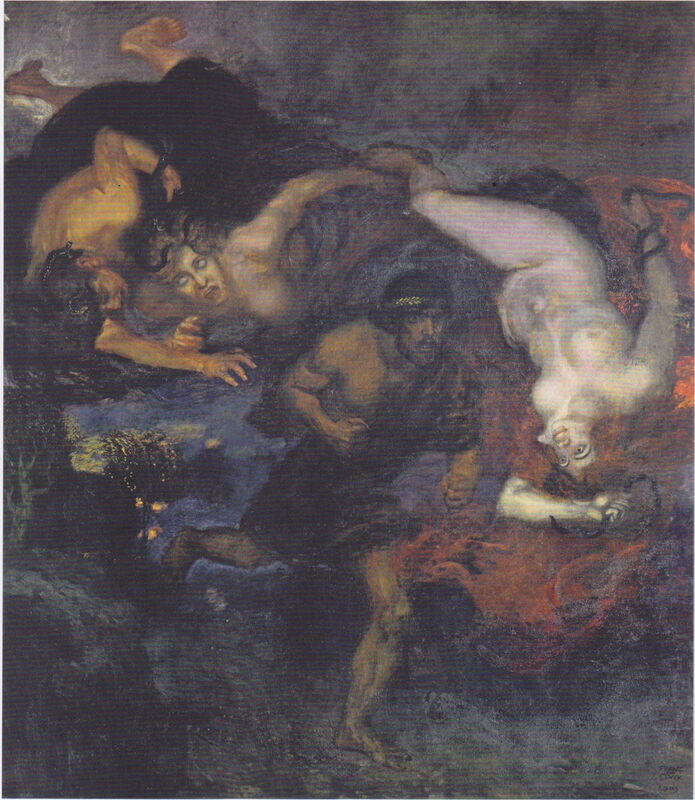 Franz von Stuck, who also painted a version of Salome, re-arranged the figures from Bouguereau’s work, in his Orestes and the Erinyes (1905). The Furies now tumble and spin through space, haunting Orestes as he tries to run away from them. John Singer Sargent (1856–1925), Orestes Pursued by the Furies (1922-25), oil on canvas, 348 × 317.5 cm, Museum of Fine Arts Boston, Boston, MA. Wikimedia Commons. 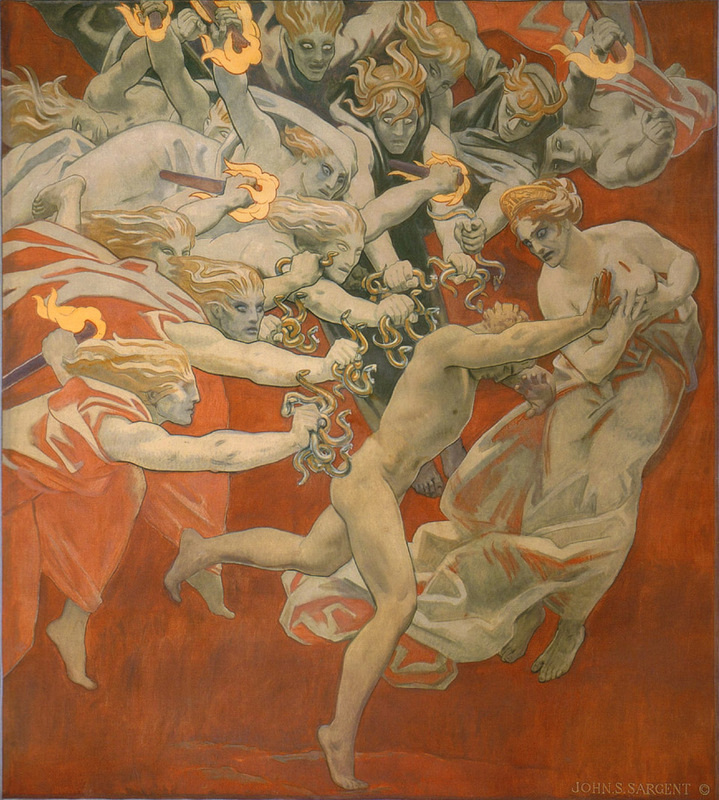 John Singer Sargent’s large masterpiece Orestes Pursued by the Furies was started in 1922, and completed in 1925, just prior to his death. 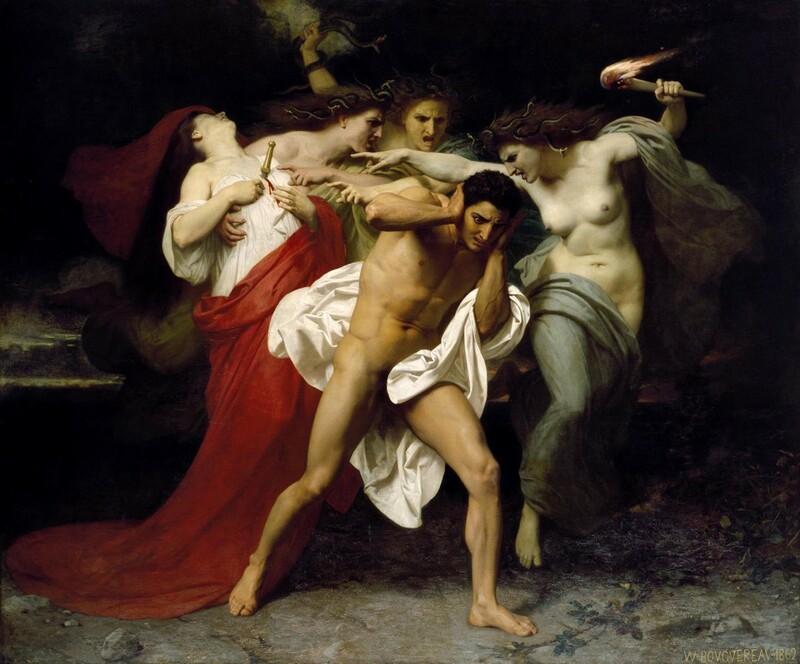 Over its 100 square feet of canvas, it shows a young and naked Orestes cowering under the attacks of the Furies, as he tries to run from them. The swarm of no less than a dozen fearsome Furies have daemonic mask-like faces, blond hair swept back, and hold out burning brands and fistfuls of small snakes. Sargent has gilded the flames on the brands, which makes them shine proud, just like fire. The isolated woman who stands in Orestes’ way is no Fury, though: she wears a gilded crown, and with the clean incision of a stab wound above her left breast can only be his mother, Clytemnestra. As with Hennequin’s earlier painting, Sargent shows a profusion of arms, eight of them clutching snakes and thrust in Orestes’ direction. I have no idea why so many history painters did not attempt this richly visual story: it has everything that you could possibly want in a myth. Sargent’s inspired choice fired his genius, and he produced one of the greatest narrative paintings of the twentieth century. Follow the track of blood, the silent sign! For scent of mortal blood allures me here. He who did his mother slay! John Singer Sargent (1856–1925), Orestes Pursued by the Furies (detail) (1922-25), oil on canvas, 348 × 317.5 cm, Museum of Fine Arts Boston, Boston, MA. Wikimedia Commons. Aeshylus, translated by EDA Morshead (1889), The House of Atreus, Wikisource here. Posted in General, Painting and tagged Bouguereau, Hennequin, Lafitte, Moreau, narrative, painting, Rahl, Sargent, von Stuck. Bookmark the permalink.